Don’t know what to write about? You need a blogging plan! Having a defined set of topics (categories) is a vital part of any blogging plan and content marketing strategy. Ideally you want to find topics that intersect your audience’s interests and your own. Just be sure that you or someone on your team has the interest, knowledge and ideas to keep writing about each of those topics. So what happens when you don’t have clarity about your blogging topics, why your blog exists, and how you will be using it? I’m Linda Dessau of Content Mastery Guide, and I’ve been guiding people through their online writing challenges since 2005. For some, I take the process off their hands with my done-for-you services. For others, I help them build more confidence and competence with my training and editing packages. Now, you can learn and apply the same strategies and methods I’ve been using and teaching for 10+ years – all for free and from the comfort of your home or office. 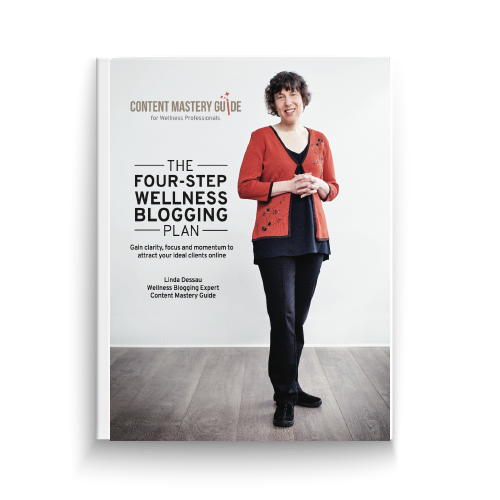 With this free, easy-to-use guide, you’ll create a blogging plan that fits your health and wellness business, your clients, your topics, and your schedule. A blogging plan will give you and your blog posts more focus, and will keep you on track posting content month after month, more easily than you ever dreamed. Best yet, this well-planned content will cement your credibility as an expert, and attract the ideal clients for your health and wellness business.